Unless they are chocolate and so filled with goo. Then nibbled the part and licked off the icing. Like Cupid, his arrow, with a bit of panache. For that’s when I’ll wear that red, silky teddy. When love’s on the line and the sentiment’s true. In a bed and breakfast or a ritzy hotel. Spend the weekend curled up, not a thing is too much. 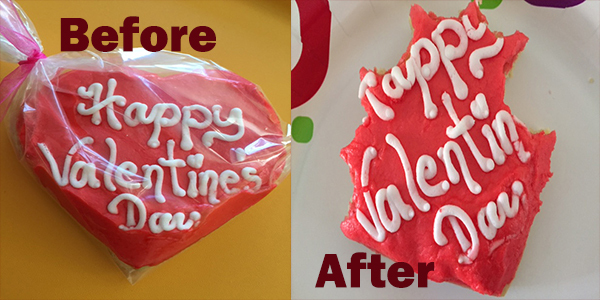 This entry was posted in Chocolate, Humor, Life, Love is life, Personal Ramblings, Relationships, Romance, Vickie McKeehan, Writers and tagged Cookie, hearts, Love, Relationships, Romance, Valentine's Day by vickiemckeehan. Bookmark the permalink. The book Just Evil is the first book that I have read by Vickie McKennhan and it was an absolutely wonderful trip. When I got to the end I was not wanting it to end. I needed more then I remembered that I had bought book 2 and book 3. I am so glad I already had the whole series. Deeper Evil started out like I had turned to the next page and if I had not read Just Evil it would have explained in Deeper Evil the story still would have been great but I am glad I read Just Evil first for the suspense of the story she weaves the the whole story together again with more explanation it was intriguing and it is full of suspense, treachery, murder, evil and love. People who care about others and people who walk on others. I am about 1/3 thru book 2 and excited about book 3. I have already started to buy her books in different series. Vickie , so glad I found you so keep up the great work! !